This bite is coming of the heels of the ISEE PDP workshop (I tried to look up the acronyms, I failed), bringing grad students and post docs together from all over the US to show them the value of learning through inquiry and to teach teachers methods to make their classes more equitable, informative and engaging. You should look them up! 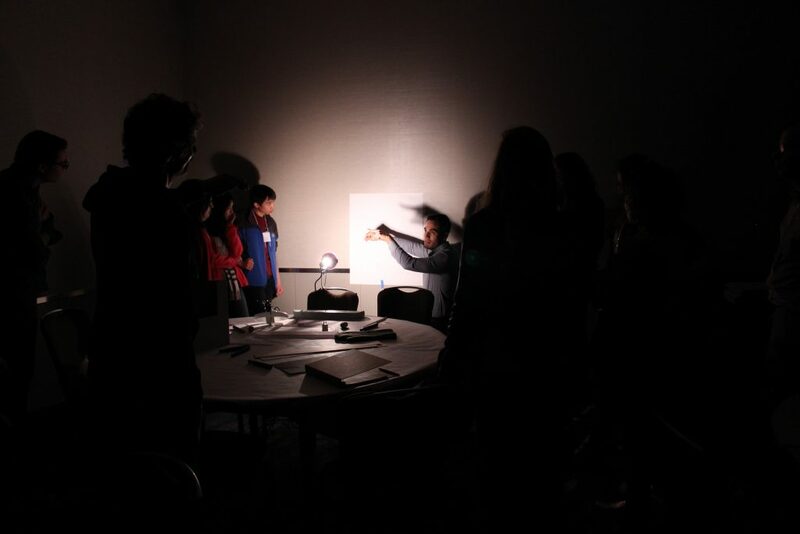 Rather than being taught how light and shadow work, participants are shown various phenomena, encouraged to form their own questions then given time to experiment and explore them in detail. It’s hard to capture the attention of students, hard to engage them with the task at hand, and harder still to actually have them walk away with knowledge in their brain that wasn’t there before. Happily it’s also fantastically rewarding. It forces you to really grapple with the subject you’re teaching, obliging an understanding that’s not just sufficient for you, but for each and every student you teach. It’s incredibly gratifying to see a student succeed (and conversely, can be heart-breaking to see another fail) and students recognize good teaching and good teachers long after the last word of a lecture has been spoken. All too often though, we are not taught to teach. The role of teacher might be at the forefront of our picture of the academic, but it’s a skill in which they are rarely trained. Academics teach because they have mastered the complex subject matter, not the methods of disseminating it. Many individuals, and even institutions, are sympathetic to the logical fallacy that the quickest learners are the best teachers. But research will always be the main focus of a career academic, and burrowing into the world of pedagogy requires a luxury of time that many lack. However, whilst great teaching is an arcane art, good teaching is a simple science. I’d like to share with you one simple idea, perhaps so simple it will be dismissed as obvious, that can alone entirely change the effectiveness of an explanation. This applies not just to lecture halls steeped in old chalk dust, but to the thousands of ways we try to explain, influence and engage others. From the nerve center of a news network to family dinner tables to the halls of government to this very bite. Put simply: work out what you want someone to learn, then teach them it. Decide what content, what understanding, is feasible and useful for someone to glean. Build arguments only out of the pieces needed to make the point you’re pushing towards. And, if you have the opportunity, encourage them to test and apply that content to highlight the strengths and limits of their understanding. 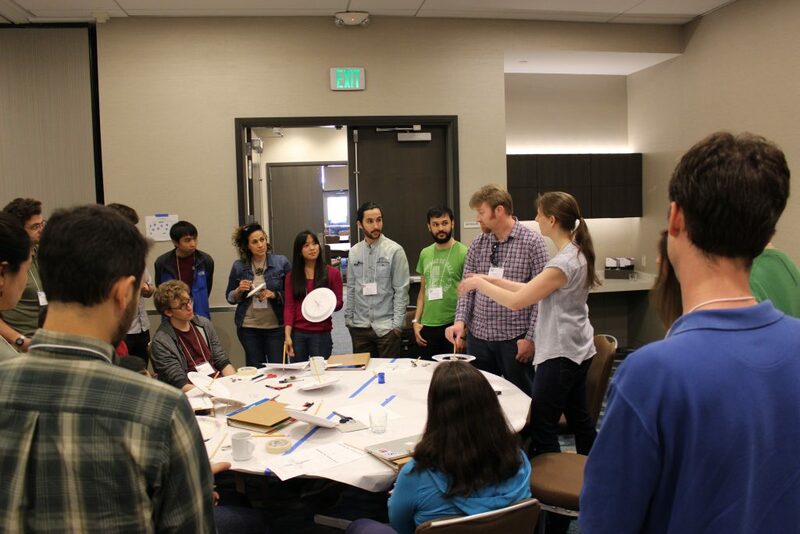 Nearly a hundred grad students, from all disciplines of STEM, grappling with spinning tops, to understand better which methods of teaching work best for them, and by extension their students. It is all too easy to teach by repeating what you’ve heard and learned before, cutting content and adding nuances where you thought an explanation was lacking or sagging under a weight of superfluous detail. But if all you do is copy and cut, you’re not much better than a broken photocopier. Science is a philosophy, not a history, and yet we teach it with a more rigorous appeal to chronology than the French revolutionary calendar. Pressure and temperature are phenomena that stem directly from a picture of materials as atoms and molecules, and yet students learn about vacuums long before particles, simply because Pascal and Kelvin did their thing before Dalton, Brown and Einstein even thought it was cool. In astronomy we teach conventions that have been festering for hundreds of years, like the brightest stars having the least magnitude, not because it’s the heart of the science, but because it’s what our teachers’ teachers taught. We can slip into what seems the “right” things to say and order to say them without ever really questioning if it’s the most effective way to make a point. Conversely, if we put the point we’re trying to make at the forefront of our mind, sorting out those elements that are and are not integral becomes trivial. What you get at the end can only be made of what you put in at the beginning. So if you have your goal in mind, the steps you need to take to get there are all but laid out in front of you. 60 years ago I was a young teenager who dreamed of becoming an astrophysicist but was too intimidated by integral calculus. To think what I missed out on! Cheers to you and your fellow astrobiters! I wish I were 60 years younger and could join in the great fun you are all having now!